Are you planning a safari to Africa? You obviously need travel advice to ensure an enjoyable and memorable stay. Traveling to the destination you have never been to becomes challenging sometimes with limited knowledge of what it requires. 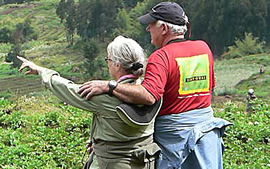 Fortunately, Gorilla Trek Africa offers you the best travel advice to Africa. 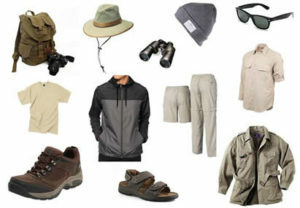 One of the most challenging tasks is what to pack for an African safari. The kind of attire to wear depends on the destination tour choose to visit and the time of the year since weather changes with the season. However for most of the regions in Africa; the weather is averagely warm through out they year with some wet seasons and hot spells depending on your destination. Whether you are planning a gorilla safari, game viewing, cultural tour, mountain hiking or any other African safari, We advise on you on the do’s, donot’s and all you need to pack to ensure a peaceful stay in our land Africa. Generally the days in Africa are warm; shorts and t-shirts are ideal for a safari in most regions of Africa, but nights can be cold in some regions so long-sleeved shirts, long trousers and pullovers are essential. However during the warm months mosquitoes are many, your long trousers and long-sleeved shirts can serve as a protection from mosquitoes in the dense forests on your safari. Mosquito nets are readily installed in most safari lodges, hotels and camps to make sure your sleep is comfortable and protected from mosquitoes. It is good to maintain clothing in earthy colors such as khaki, brown, beige and olive because bright colors may affect animal behavior. Footwear is an important aspect of a safari in Africa for walking activities; we recommend comfortable and practical footwear. If you have any special medicinal needs – it is vital to carry enough supplies of prescription medicine for the whole duration of your safari. It can be good to bring the prescription with you in case of emergencies. It is recommendable to use a soft bag or backpack for your luggage to a safari in Africa; safari vehicles and aircraft have limited space. A day pack is also advised for carrying personal items such as binoculars and cameras. Packaged safaris have minimal safety risks as your tour guide will get updates about the area you are about to travel. Keep to small groups and don’t take a lift from a stranger when you are on your own. Read the local news; in Uganda and Rwanda many local daily news papers and Radio stations broadcast in English and French, and websites like:- http://www.newtimes.co.rw, http://www.newvision.co.ug, http://www.monitor.co.ug are updated with top stories in the region daily. The central areas of the larger cities (kampala and Kigali) have a very minimal criminal element that can prey on unwary tourists. Do not walk alone in apparently deserted places especially at night; wherever possible walk with a group. Do not carry more cash than required. Keep a photocopy of the first few pages of your passport, visas and air tickets, separately from the original documents. Keep close to your tour guide. When driving in Africa there are a few simple rules, drive carefully and slowly (speed kills), remember animals and humans can cross the road at any time (quite often just in front of you), try never to drive at night, stay alert as roads are often poorly maintained and potholes are to be found. Another fairly common occurrence are vehicles in poor mechanical conditions. If you are renting a car, keep the doors and windows locked while driving in the major cities. Always listen to your guide! When visiting wildlife areas do not walk into the bush without your guide! Do not approach any wild animals: It is dangerous! Do not swim in any rivers (common presence of crocodiles and hippos)! Never feed any animals, however inquisitive they may appear to be! If unsure of any area, approach the local police station or tourism office for further advice and guidance.